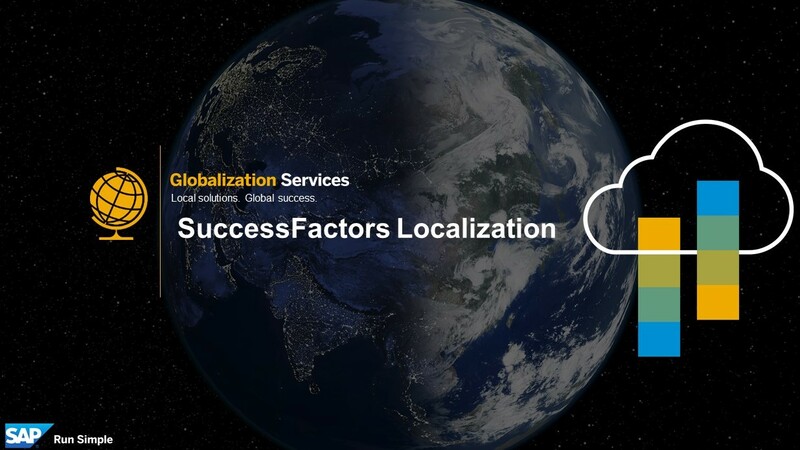 What is Localization at SAP SuccessFactors ? I lead the Product Management team for Employee Central, Successfactors localization. I decided to write this blog because many people think or understand that localization is merely doing translations or handling currency and date formats. I would like to say that for us at SAP SuccessFactors Localization, this is only a fraction of what we do. Below are some of the examples of what we offer as localization and what it means to us. I hope that by the end of the blog, you have a clearer understanding of the scope and vision of localization we have in mind at SAP Successfactors. In Employee Central (EC) as of Q3 2017, we support localization for 84 countries. As part of country localizations, we deliver country specific fields for National IDs, Address Formats, Name formats, Bank formats, Contract Details, Dependent details and deep validations. EC Payroll supports 42 countries as of today. This means that we take care of Payroll processing, legal reporting and integrate this to Employee Central for 42 countries. Not just country specific fields/data, we also support common local processes and best practices. For example in India it is common that Employees produce proof at end of year for Income Tax relief. We have enabled that in EC. Or in Brazil there is a law to ensure employees are not dismissed during certain life events like maternity. This is called Dismissal Protection. We support this today. In the Middle East for example, its common to have expats, thus Visa processing and management is a day-to-day ,time consuming and heavy volume task for administrators. We are working to build out this solution. We are also building localization for Time and Benefits processes. For example in Q2 2017 – as part of EC Time localization, we delivered the capability around Australian leave liability calculations and Employee Termination payouts. In Q3 2017, we are delivering the solution to support US specific for Benefits Open Enrollment. The list goes on. These Local Product Managers are close to the country or region and know exactly what that country market needs. They understand the pulse of the local people, best practices, they are close to the government agencies and keep track of legal changes very closely. In addition, many of these legal regulations are subject to frequent changes due to government policy changes. As part of our release cycles, we ensure that our customers get such legal changes on time. Brazil e-social, UK NINO or South Africa SARS are some such example. For us legal change delivery is top priority. You may wonder, how we do we gather such requirements from different parts of the world. We are able to do this successfully and accurately because we have a massive team of Local Product Managers, physically located in 61 different countries across the globe. From Canada to Japan, from Finland to South Africa, we are all over. We are all part of a unit called Globalization Services at SAP. The above is what we do today. There is much more that we plan to do. We want to enable customers across the globe and help them move to the cloud for their HR processes with ease, without worrying of their country specific best practices and legal compliance. The journey is long. However, only SAP has the capability, resources and the knowledge to pull this off. Real localization cannot happen from one place – it needs a team spread out over the world. We at SAP Globalization Services and Successfactors make this happen. Director Product Management, Employee Central Localization and Global Benefits. Thanks for sharing Deepika ! Very helpful. Great post, Deepika! Spot on. We had an iXerv CloudCast on this topic last week. That video can be found at this link and complements your information nicely. I’m glad this topic is getting the attention it deserves! Thanks for the great post Deepika. Is there a platform where we can enquire about the plan as which all countries’ have been planned for the next future releases? For example: we are regularly asked about localisation of EC for New Zealand ?? Thanks for sharing the brought view on localization, what it means and covers looking through the “glocal” glasses from a customer and product perspective. Thanks for your post Deepika! I was wondering if the list of supported localizations is still the same. Is there any updates regarding the localization of SF for Bahrain?